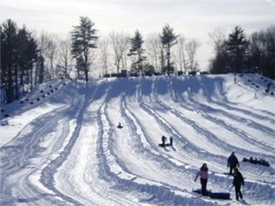 Cruise the slopes of Nashoba Valley's Snow Tubing Park seven days and seven nights. Bring the family and enjoy one of the fastest-growing winter recreational activities. Serviced by four lifts and maintained by Nashoba's experienced grooming fleet, the park provides 11 lanes of ideal tubing conditions for thrill seekers of all ages. 42' in height or 6 years old to participate. One person per tube! (Parents cannot take smaller children on the tube with them, they must be tall enough and old enough to ride alone). Take Rt. 2 West to Concord Rotary, then go West on Rt. 2A. Follow for 6.5 miles and the entrance to the park is on the right. through the light and follow for 1.5 miles. The entrance is on the left. Check out our Boston Winter Fun Guide for lots more great ideas on things to do with the kids this winter.